Throughout the year, as part of our Caring Beyond the Classroom program, children and staff at New Horizon Academy engage in activities that give back to the local community. The Caring Beyond the Classroom program cultivates a lifelong commitment to service and encourages collaboration and problem-solving, while promoting social responsibility, positive citizenship, empathy, kindness, and compassion. When children participate in the Caring Beyond the Classroom program, it empowers them and increases self-confidence, which is consistent with our company’s mission and philosophy. In honor of I Love to Read month, children, families, and staff collect new and gently used books for Reach Out and Read. 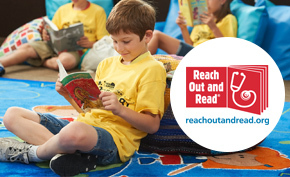 Reach Out and Read is a nonprofit organization that gives young children a foundation for success by incorporating books into pediatric care facilities and encouraging families to read aloud together. Since our partnership began, we have collected over 50,000 books for children to help start them on a path of success before they enter school. 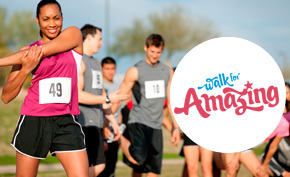 New Horizon Academy is a proud sponsor of Walk for Amazing (formerly Heart Beat 5000), an annual race to support children’s heart health. The walk raises money for the Children’s Hospital and the work they do with children born with Congenital Heart Defects/Disease (CHD). "New Horizon Academy's book drive has greatly increased our capacity to serve children across the state. By donating over 6,000 gently used books each year, the parents and staff of New Horizon Academy have given our clinics the opportunity to create literacy-rich waiting areas and exam rooms for the children they serve, as well as give patients and their families books to take home."